Editor-in-Chief Dr. Donald Furman, State University of New York System, USA. 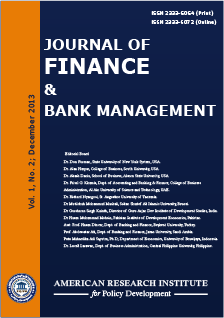 Journal of Finance and Bank Management serves both academics and practitioners concerned with the financial management of nonfinancial businesses, financial institutions, banks and public or private not-for-profit organizations. The journal publishes theoretical and empirical research papers spanning all the major research fields in finance and banking. It seeks to provide an outlet for the increasing flow of scholarly research concerning financial institutions and the money and capital markets within which they function. The Journal's emphasis is on theoretical developments and their implementation, empirical, applied, and policy-oriented research in banking and other domestic and international financial institutions and markets. The Journal's purpose is to improve communications between, and within, the academic and other research communities and policymakers and operational decision makers at financial institutions - private and public, national and international, and their regulators. Journal of Finance and Bank Management actively encourages global contributions from scholars across the broad domain of finance and banking. It welcomes novel and ground-breaking contributions from a wide range of research traditions within banking and financial management. The journal follows strict double blind peer review policy. Each paper published in Journal of Finance and Bank Management is assigned a DOI®number, which appears beneath the author's affiliation in the published paper. Click HERE to know what is DOI (Digital Object Identifier)? Click HERE to retrieve Digital Object Identifiers (DOIs) for journal articles, books, and chapters. Dr. Alan Harper, College of Business, South University, USA. Dr. Akash Dania, School of Business, Alcorn State University, USA. Huijian Dong, Ph.D., College of Business, Pacific University, Forest Grove, OR 97116, USA. Dr. Faisal G. Khamis, Dept. of Banking and Finance, AL-Zaytoonah University of Jordan. Dr. Richard Nyangosi, St. Augustine University of Tanzania. Dr Muslichah Mohammad Machali, Sultan Sharief Ali Islamic University, Brunei. Dr Gursharan Singh Kainth, Director of Guru Arjan Dev Institute of Development Studies, India. Dr Hasan Muhammad Mohsin, Pakistan Institute of Development Economics, Pakistan. Asst. Prof. Hasan Dincer, Dept. of Banking and Finance, Beykent University, Turkey. Putu Mahardika Adi Saputra, Ph.D; Department of Economics, University of Brawijaya, Indonesia. Dr. Lucell Larawan, Dept. of Business Administration, Central Philippine University, Philippine.